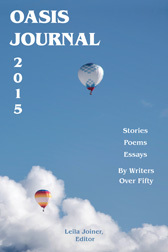 Official website for OASIS Journal, an annual anthology of short fiction, nonfiction, and poetry for writers over 50. I am sadly behind schedule this year due to working on a different book, so still trying to get caught up! OASIS Journal began in 2002 when I was taking a class at OASIS in Tucson, Arizona from one of the two best creative writing teachers I’ve ever encountered: Dan Gilmore, who has published short stories, poetry, and a novel. For more information about OASIS Journal and Imago Press, please see the interview at Allyson Latta’s website. Submissions are accepted every year from May 1 through July 31 (postmark). Anyone at least 50 years old is eligible. Amazon and Barnes and Noble for $14. Love that Oasis has a website now — yay! It will be easier to contact you, and hopefully you won’t be as swamped on your email.